Little Foot is the beast child of Sasquatch Kick Machine. It is super lean and simple to use. It lets you get deep kick drums without any fuss. While it doesn’t have all the features that Sasquatch Kick Machine has, it has plenty of control to get deep thump out of any kick drum. We’ve all had the experience of mixing a kick drum that just didn’t have quite the oomph it needed. You can try EQing it, but that just seems to make it flabby and loose. Sometimes you need a little extra beef that you just can’t extract out of the kick drum itself. You can replace it with samples, but sometimes that alters the sound too much. Little Foot lets you add anything from subtle to extreme low end to your kick drum without compromising the original sound. It does this by triggering a low frequency sine wave that plays along with your original kick drum. You can control how deep and how hard this sine wave triggers, and how long it sustains. You can even “tune” your kick drum to match the key of the song. With Little Foot, we focused on an interface that lets you dial in your sound as quickly as possible without having to worry about a pile of other features. If a million features is what you want, Sasquatch will probably be your answer. Gate your kick, Create an aux, Add a sine wave to the aux, Gate the sine wave, Feed the sidechain input from the gated kick and you’ve got Little Foot. 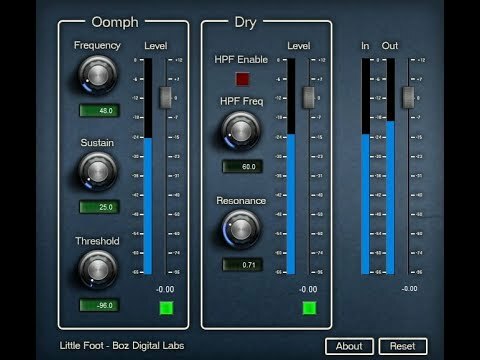 This is a classic studio trick.. Little Foot is a very clever tool for saving a number of steps and allows for the same results without the routing. Works great. Absolutely hassle free. I set this up manually once or twice (as Kris suggests), which was educational, but this is just so much easier. Stay right-brained! Love this plug! Super hassle-free (compared to the traditional way) and works as intended. Recommended!